"Highland Park, California" redirects here. For the neighborhood of Oakland, California, see Highland Park, Oakland, California. Highland Park is a historic neighborhood in Northeast Los Angeles. It was one of the first subdivisions of Los Angeles, and is currently inhabited by a variety of ethnic and socioeconomic groups. The 2000 U.S. census counted 56,566 residents in the 3,42-square-mile neighborhood—an average of 16,835 people per square mile, one of the highest densities in Los Angeles. In 2008 the city estimated that the population had increased to 60,841. The median age for residents was 28, considered young when compared to the city at large. Highland Park was considered moderately diverse ethnically. The breakdown was Latinos, 72.4%; Asians, 11.2%; blacks, 2.4%, whites, 11.3%; and others, 2.6%. Mexico (55.3%) and El Salvador (12.0%) were the most common places of birth for the 57.8% of the residents who were born abroad, a figure that was considered high compared to the city as a whole. The median household income in 2008 dollars was $45,478, about average for Los Angeles, and a high percentage[vague] of households earned $40,000 or less. The average household size of 3.3 people was high for the city of Los Angeles. Renters occupied 60.9% of the housing units, and house- or apartment owners the rest. The percentage of never-married men was among the county's highest. The 2000 census found 2,705 families headed by single parents, a high rate for both the city and the county. There were 1,942 military veterans in 2000, or 4.9%, a low figure for Los Angeles. Highland Park sits within the Northeast Los Angeles (NELA) region of LA along with Mt Washington, Cypress Park, Glassell Park and Eagle Rock. The area was originally discovered thousands of years ago by ancestors of the Chumash people, and would later be settled by the Tongva. After the founding of Los Angeles in 1784, the Corporal of the Guard at the San Gabriel mission, Jose Maria Verdugo, was granted the 36,403 acre Rancho San Rafael which included the present day Highland Park. Drought in the late 1800s resulted in economic hardship for the Verdugo family, and Rancho San Rafael was eventually auctioned off in 1869 for $3,500 over an unpaid loan. The San Rafael tract was purchased by Andrew Glassell and Albert J. Chapman, who leased it out to sheep herders. In 1885 during the 1880s land boom, it was sold to George Morgan and Albert Judson, who combined it with other parcels they had purchased from the Verdugo family to create the Highland Park tract in 1886. Two rail lines were built to Highland Park, which helped the town to survive as the 1880s land boom ended. Highland Park was annexed to Los Angeles in 1895. In the early 20th century, Highland Park and neighboring Pasadena became havens for artists and intellectuals who led the Arts and Crafts movement. Temple Beth Israel of Highland Park and Eagle Rock was founded in Highland Park in 1923 and constructed its building in 1930. It is the second oldest synagogue in Los Angeles still operating in its original location, after the Wilshire Boulevard Temple (built in 1929). With the completion of Arroyo Seco Parkway in 1940, Highland Park began to change. By the 1950s, the artsy enclave experienced white flight, losing residents to the Mid-Wilshire district and newer neighborhoods in Temple City and in the San Fernando Valley. By the mid-1960s, it was becoming a largely Latino enclave. Mexican immigrants and their American-born children began owning and renting in Highland Park, with its schools and parks become places where residents debated how to fight discrimination and advance civil rights. In the final decades of the 20th century, Highland Park suffered waves of gang violence, as a consequence of the Avenues street gang claiming the adjacent Glassell Park neighborhood and parts of Highland Park as its turf. At the dawn of the 21st century, the city attorney intensified efforts to rid Highland Park and Glassell Park of the Avenues. In 2006, four members of the gang were convicted of violating federal hate crime laws. In June 2009, police launched a major raid against the gang, rooting out many leaders of the gang with a federal racketeering indictment. By 2009, the city demolished the gang's Glassell Park stronghold. Law enforcement, coupled with community awareness efforts such as the annual Peace in the Northeast March, have led to a drastic decrease in violent crime in the 2010s. Starting in the early 2000s, a diverse mix of people began arriving to Highland Park to seek out, buy, and revitalize Craftsman homes, some which had suffered neglect over the decades. Many of Highland Park's oldest homes were razed during the 1950s and 1960s. One architecturally significant home made its way to Heritage Square Museum, thanks to the efforts of local activists dedicated to saving Victorian homes scheduled for demolition. Like Echo Park and Eagle Rock, Highland Park has steadily seen some gentrification. People from across the region have been attracted to the historic Craftsman homes that escaped demolition. Its relatively low rents have made it increasingly popular among young people who value the walkable urban lifestyle afforded by the older style of neighborhood. Once again, Highland Park is building a reputation as a mecca for artists, with trendy shops, galleries, bars and restaurants opening throughout the neighborhood. One of the last typewriter shops in the City of Los Angeles, U.S. Office Machine Company, specializes in repairing antique typewriters and has restored a few for movie studios. It is one of three businesses located in the old Sunbeam Theatre. It is owned by longtime resident Jesse Flores. The statue Chicken Boy was relocated from a downtown Los Angeles restaurant in 2007. A number of shops selling vintage clothes and boutiques offering hip home-decor accessories have opened along York Boulevard. Highland Park is home to a recording studio and pop-up space for Los Angeles-based hip-hop label, Stones Throw Records. Highland Park has a legacy of local businesses, some that have been a staple in the Highland Park community for over 20 years. The first of such businesses is Galco's Soda Pop Stop. Galco's has been family owned and operated for more than 100 years. In addition, another cultural landmark in Highland Park is Avenue 50 Studio. Avenue 50 Studio is a nonprofit community-based organization grounded in Latino and Chicano culture. Gangster Squad - In early 2012 the entire Highland Park downtown area along Figueroa Street was redone to look like post-WWII-era Los Angeles for the film. Television and features films have used the old Los Angeles Police Department building in the 6000 block of York Boulevard. Smith Estate, an historic hilltop Victorian house, has been a shooting location for horror films such as Spider Baby, Silent Scream and Insidious: Chapter 2. The Los Angeles County Department of Health Services operates the Central Health Center in Downtown Los Angeles, serving Highland Park. The United States Postal Service Highland Park Post Office is located at 5930 North Figueroa Street. Los Angeles Fire Department Station 12 is in the area. 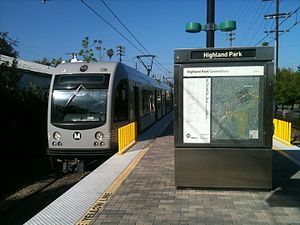 Highland Park is served by the Highland Park (LACMTA station), along Metro's Gold Line light rail line. The station is an island platform located near the intersection of North Avenue 57 at Marmion Way, (one block west of North Figueroa Street). It is also served by Metro Local bus lines 81, 83, 176, and 256, as well as LADOT's DASH Highland Park/Eagle Rock bus line. Highland Park is served by the historic Arroyo Seco Parkway (California State Route 110), formerly known as the Pasadena Freeway. Highland Park is zoned to the following schools in the Los Angeles USD (LAUSD). Charles Lummis, journalist, Indian activist and librarian. Hubert Selby Jr., author, poet. ^ a b "Los Angeles Times Neighborhood Project". The Los Angeles Times. Retrieved 2010-04-11. ^ a b c Los Angeles Department of City Planning, Highland Park-Garvanza Historic Preservation Overlay Zone (2010-12-09). "4.1 History of Highland Park & Garvanza". Highland Park-Garvanza HPOZ Preservation Plan, Including Garvanza, Highland Park, Montecito Heights and Mount Angelus Neighborhoods (PDF) (Report). Los Angeles Department of City Planning. pp. 17–20. Archived from the original on 2017-09-03. Retrieved 2017-08-17. 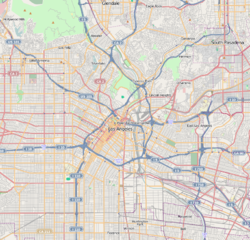 ^ a b c d "Highland Park Profile - Mapping L.A. - Los Angeles Times". Projects.latimes.com. Archived from the original on 2017-09-03. Retrieved 2013-10-27. ^ "The Highlands". Departures. Kcet.org. Retrieved 2013-10-27. ^ "Arroyo Culture". Departures. Kcet.org. Retrieved 2013-10-27. ^ Leibowitz, Ed. "Finding Sanctuary". Archived from the original on 2008-09-16. ^ "History". Archived from the original on 2009-04-29. ^ "The Parkway". Departures. Kcet.org. Retrieved 2013-10-27. ^ "Brown and Proud". Departures. Kcet.org. Retrieved 2013-10-27. ^ Mozingo, Joe; Quinones, Sam; Winton, Richard (February 23, 2008). "A gang's staying power". Los Angeles Times. ^ Rubin, Joel (September 22, 2009). "Major police raid targets L.A.'s notorious Avenues gang". Los Angeles Times. ^ Quinones, Sam (February 5, 2009). "Avenues gang bastion is demolished". Los Angeles Times. ^ Logan, Tim (December 21, 2014). "Highland Park renters feel the squeeze of gentrification". Los Angeles Times. ^ Lazo, Alejandro (March 11, 2012). "Highland Park becoming gentrified". Los Angeles Times. ^ McDonald, Kathy A. (June 18, 2008). "Edgy neighborhoods attract frosh buyers". Variety. ^ "Experience an alternative Los Angeles". London Evening Standard, February 22, 2012. Archived from the original on April 5, 2012. ^ Nakano, Craig (March 9, 2012). "York Boulevard, Highland Park: A hub of hip, really". Los Angeles Times. ^ "Somewhere in Highland Park, East Los Angeles there exists Stones Throw Studios, now open and ready for business". February 22, 2017. ^ "GALCO'S SODA POP STOP | 7 Reinterpreting Highland Park | Departures". KCET. 1999-02-22. Archived from the original on 2013-10-29. Retrieved 2013-10-27. ^ "Avenue 50 Studio | Art | Highland Park Field Guide". KCET. Retrieved 2013-10-27. ^ "Film locations for Reservoir Dogs (1992)". Movie-locations.com. Retrieved 2013-10-27. ^ "Highland Park bar gets a Hollywood close-up". The Eastsider LA. 2011-03-21. Retrieved 2013-10-27. ^ "Gangster Squad Recreates Mickey Cohen's 1940s LA - LA Plays Itself - Curbed LA". La.curbed.com. 2012-05-10. Retrieved 2013-10-27. ^ "Yes Man - Filming Locations - part 1". Seeing-stars.com. Retrieved 2013-10-27. ^ "Offbeat Rom-Com Cyrus Premieres at LA Film Festival". Blogcritics. 2010-06-19. Retrieved 2013-10-27. ^ "Tour Location: 6045 York Blvd, Los Angeles, California". The Movieland Directory. Archived from the original on 2013-10-29. Retrieved 2013-10-27. ^ "Post Office Location - HIGHLAND PARK." United States Postal Service. Retrieved on December 9, 2008. ^ "Los Angeles Fire Department — Fire Station 12". Lafd.org. Archived from the original on 2013-10-29. Retrieved 2013-10-27. ^ Susan Carrier (2003-10-12). "History hopes to repeat itself in Highland Park". Los Angeles Times. Archived from the original on 2009-01-20. Retrieved 2008-12-26. ^ "You are about to leave the LAUSD Domain". Lausd.k12.ca.us. Retrieved 2013-10-27. ^ "Los Angeles Unified School District". Burbankms.lausd.k12.ca.us. Retrieved 2013-10-27. ^ Hochman, Steve (1994-02-20). "Don't Get Bitter on Us, Beck : Thanks to his rap-folk song 'Loser,' the 23-year-old musician is one of the hottest figures to emerge from the L.A. rock scene in years. But now that he's going national, how will he hold up under all the attention?". Los Angeles Times. Retrieved 1 May 2013. ^ "Sunday in the dungeon with Jackson Browne". The Eastsider LA. Retrieved 2013-10-27. ^ Bradford Caslon, "Rose La Monte Burcham -- 4900 Pasadena Avenue" A Look Back at Vintage Los Angeles (November 9, 2011). ^ Cannon, Lou (1998), Official Negligence: How Rodney King and the Riots Changed Los Angeles and the LAPD, p.92. Crown. ISBN 0-8129-2190-9. Excerpt available at Google Books. ^ "Marc Maron Learned the Meaning of "Feral" from a Cat". Retrieved May 8, 2013. ^ "Fritz Poock's Water Colors". Los Angeles Times. July 2, 1933. ^ Saperstein, Pat (2014-08-07). "David Weidman, Animation Artist Whose Work Appeared on 'Mad Men,' Dies at 93". Variety. Retrieved 2014-08-29. ^ "Ariel Pink: 'I'm not that guy everyone hates'". Retrieved February 22, 2017. ^ "Highland Park pays tribute to Mike Kelley*". Retrieved February 22, 2017. ^ "A Chicano Art Collective Needs Help Bringing This Massive Highland Park Mural Back to Life". Retrieved February 22, 2017. ^ "Agreement Reached on Custody of Teen Actor". Retrieved February 22, 2017. ^ "Get to Know: Billie Eilish | MTV UK". Retrieved 2018-04-01. Wikimedia Commons has media related to Highland Park, Los Angeles.